Let’s get to building, shall we? 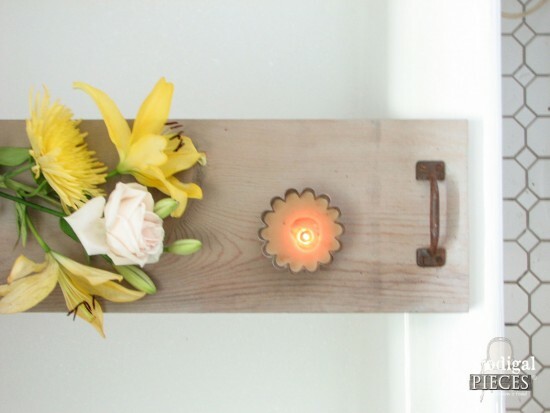 1 – 1″ x 10″ x 6′ board (can be any width you prefer and of any species – pine or hardwood) cut into lenght discussed below. 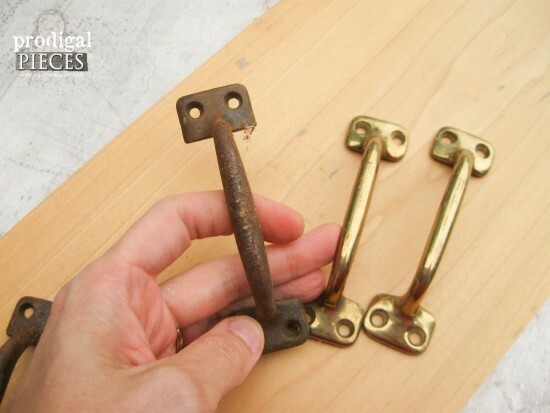 2 – 4″ window sash handles or any type of drawer pull suitable for picking up your tray – make sure it includes screws. My tub inner span measures 25″, and again write this down, so you don’t forget. (ask me how I know). Now, I want you to know that most everything I build is from reclaimed wood and I know not everyone has a mess stash like me. ahem. 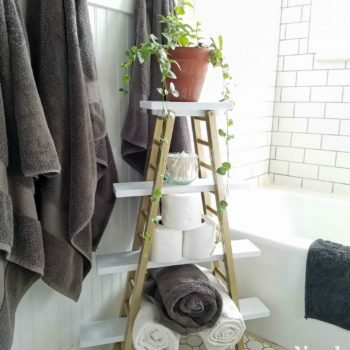 So, if you are using new wood for this project, just head to your local DIY store with your measurements in hand. 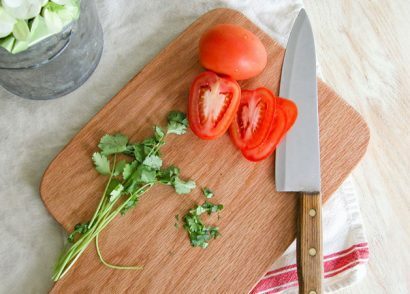 You’ll want to grab a 1″ x 10″ x 6′ (or wider) board preferably, and a 1″ x 3″ x 8′ furring strip (or whatever width you choose) and ask them to cut it to the length you need. Home Depot has a service where they cut the wood for you for FREE. Just give them your measurements and they will do it for you. There is room for error in the project, so don’t sweat it if they’re a bit off. 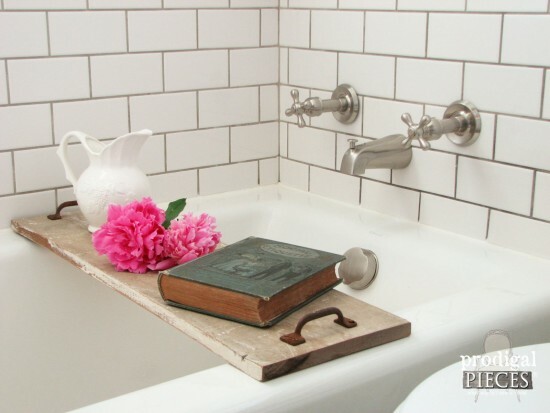 As for your measurements, you’ll be telling them to cut the board to your tub width, and the furring strip to 1″ less than the width of your board. (ie. 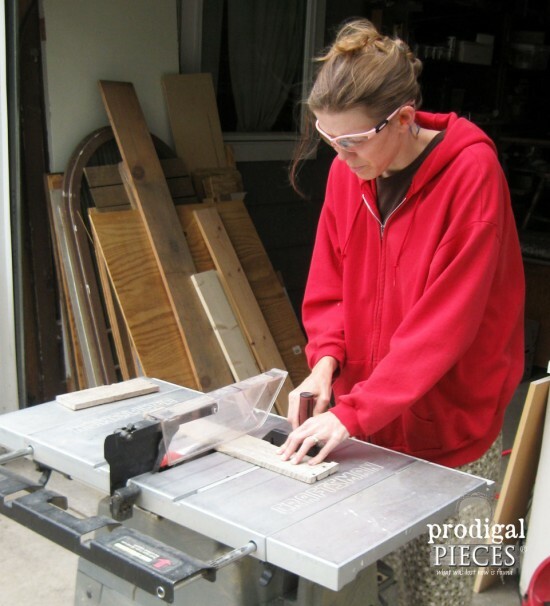 if a 10″ board, then you’ll need two 9″ pieces cut). 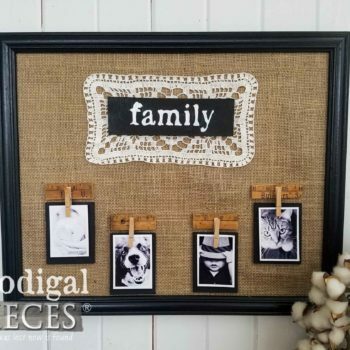 The best part about this is your wood materials should cost a few dollars and you could make two of these – one for you and one for a gift. Yay! *note: when purchasing lumber, always be sure to examine the board for knots, warping, etc. before purchasing. This will save you a headache later. Also, the sign will say 1″ x 10″, but the board is actually 9.5″. I know, I know head-banging moment, but it is what it is. 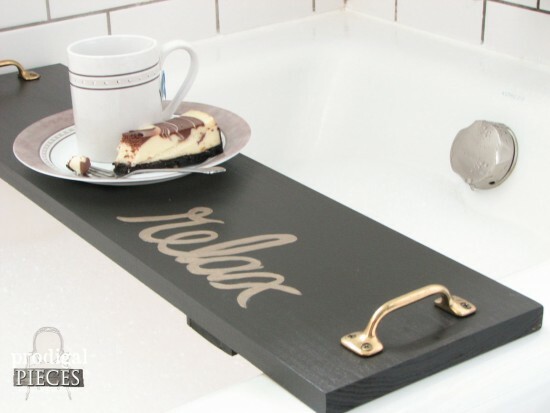 Before heading home, make sure to purchase the rest of your materials – your screws, handles/pulls, your choice of paint or stain, and wax or poly if you decide to waterproof your tray. 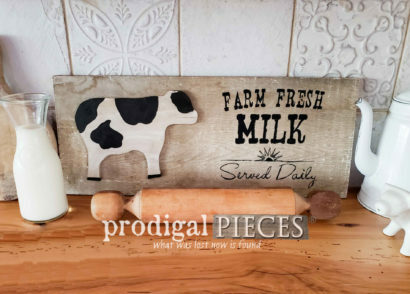 For our building purposes I’m going to be showing you two different styles of the tray – a rustic barnwood one like the tray pictured above, and a more modern style painted version. Instead of buying new wood for my examples, I am using some new wood from my stash that is an 8″ width (it’s actually only 7.5″ wide, crazy, I know.) 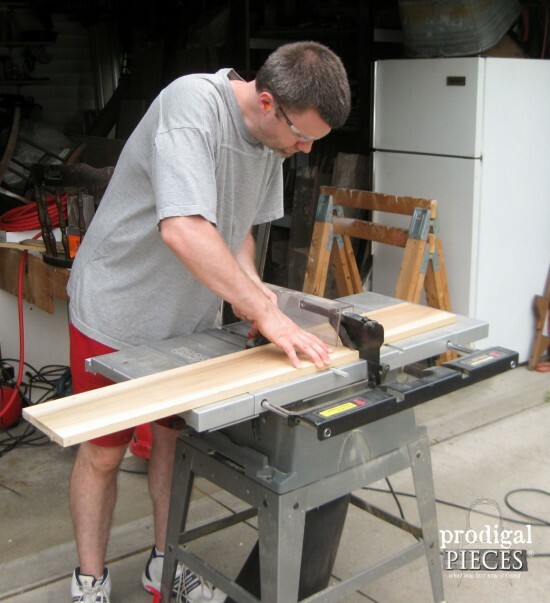 I really like the width of my 10″ barn siding tray for a bit more room, so that is why I reference to that width for your project. 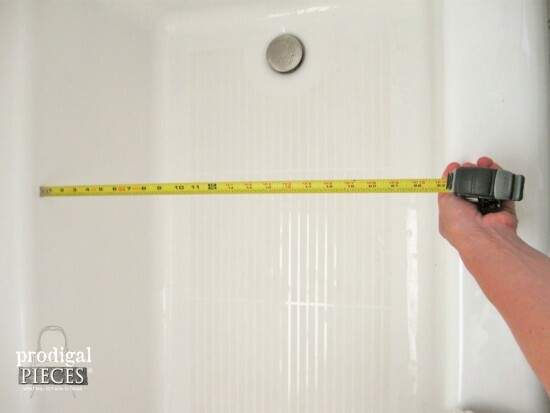 …then buzz it to the size of the first measurement you got from your tub. 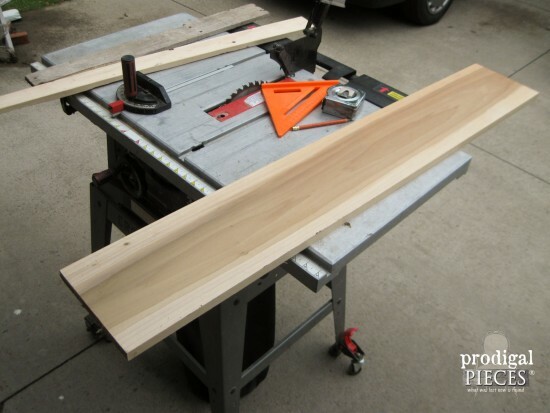 Grab your 1″ x 3″ (furring strips) and cut to length if not done in store already. 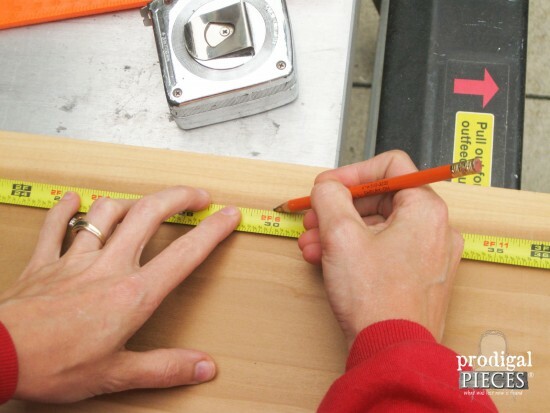 Remember, the length you need is 1″ less than the width of your board. Just a side note: This is my first time using our table saw since 2 years ago I buzzed my fingertips. My heart is beating, but happy to overcome it! 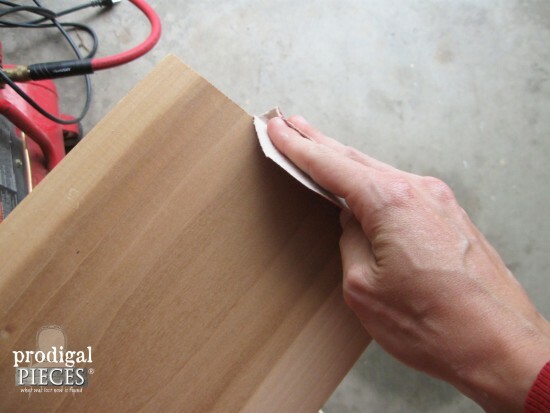 To make those cuts look pretty, just hand sand the edges and any rough spots nice and smooth. Now for the fun part…assembly. To add your slats to the bottom, use this graphic as a guide. You’re going to find the center of your board and mark lightly. 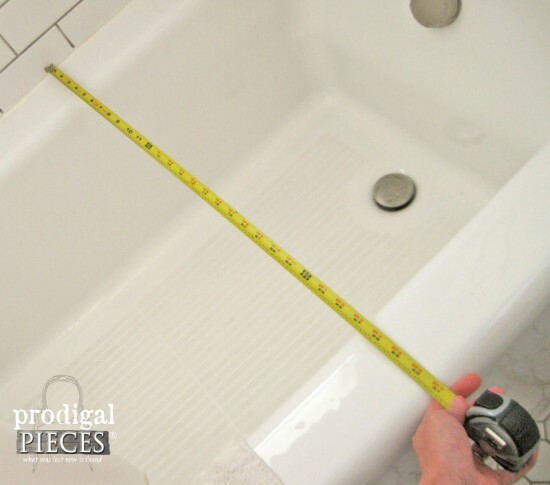 Then take the inner tub dimensions you wrote down and divide it by 2. 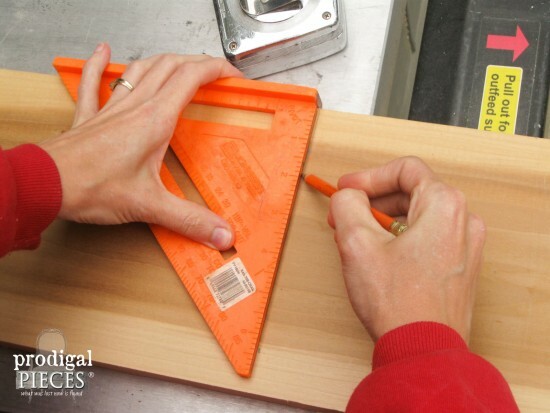 Starting from the center, measure out that length you just got and mark. 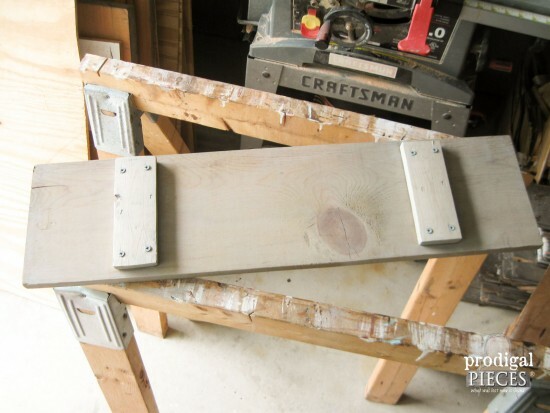 That is where the outer edge of your slat will lay. 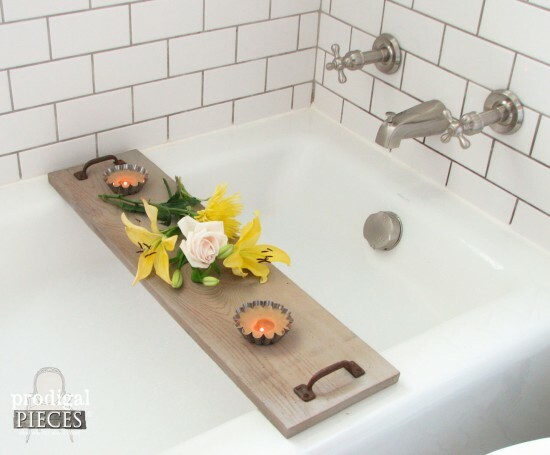 The slats are to prevent your tray from moving side to side and falling into the tub. 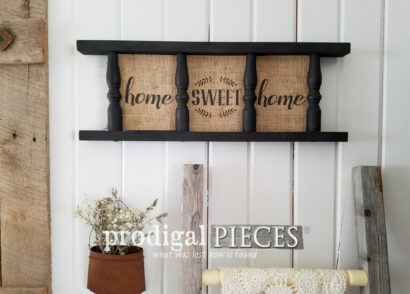 Once you’ve got your measurements marked, take your slat and center it a half-inch in from each end, and pre-drill four holes near the ends to prevent splitting of the wood. Be sure to not drill too deep or you’ll pop through the top of your board. 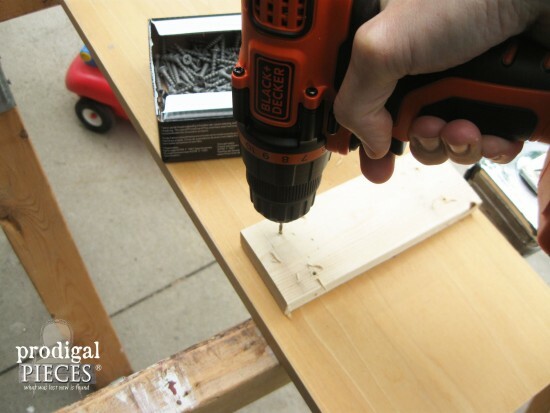 Using your 1¼” wood screws, attach the slats to your tray bottom. Flip it over and we’re ready to add holes for the handles. 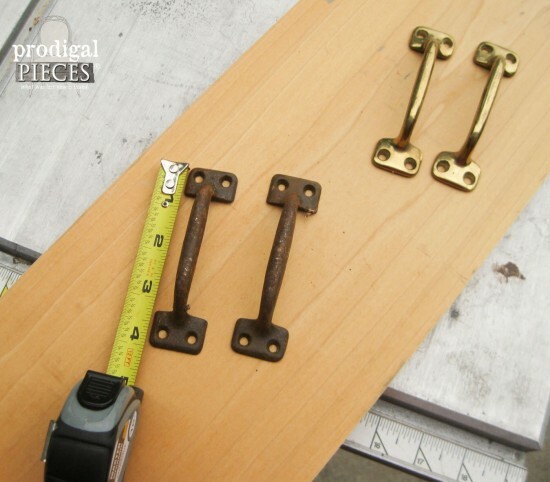 My handles measured 4″ long, but you could use knobs, longer pulls, whatever floats your boat. That’s what’s so fun about this project…endless possibilities. 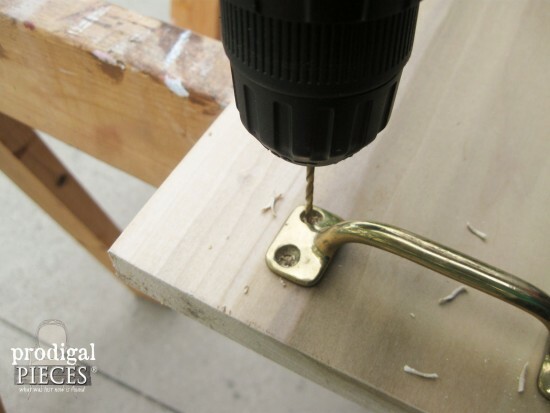 Lay your handle on the tray top and center it about 1″ in from the end, and centered top to bottom. Pre-drill for what your hardware requires and then set aside the handles for now. Now for the finishing touches. 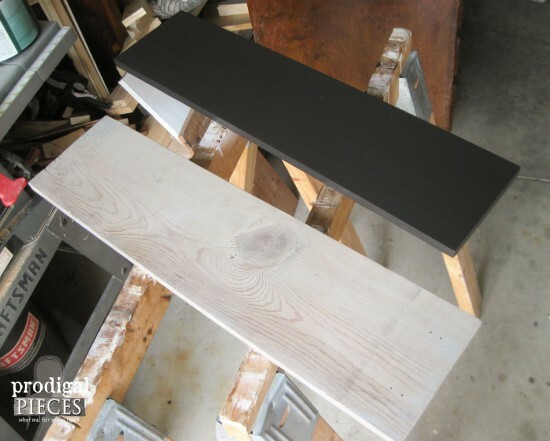 For one of my trays, I am painting it a dark charcoal semi-gloss that I found as a seconds at Home Depot, and the other I’m using a weathered look stain, called Sunbleached by Rust-Oleum Varathane. We used it on our bedroom floor and I love the look. 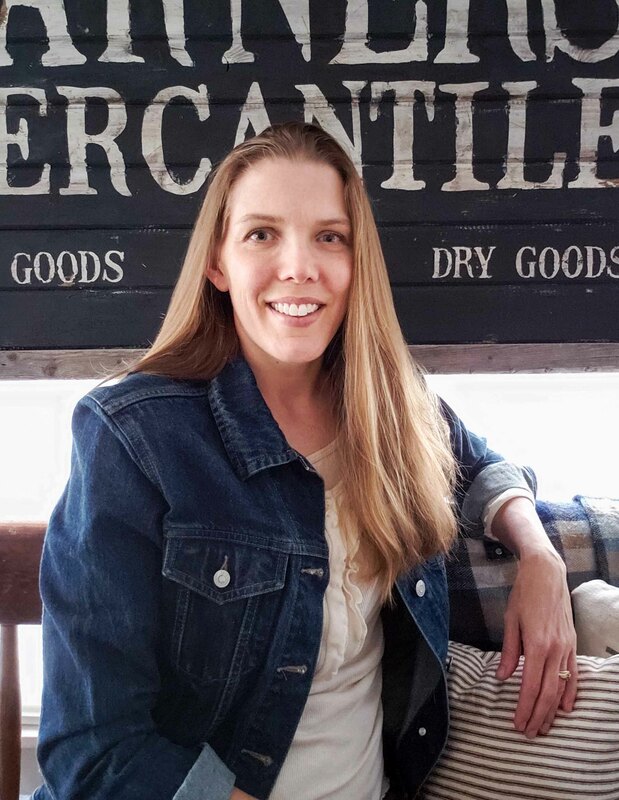 T his post contains affiliate links so you can find the products I love and I might make a penny or two if you purchase. Here’s a peek at what the underside should look like. To create a water-resistant topcoat, you could add either wax or a poly finish. It’s totally your preference. Just follow instructions on the can. 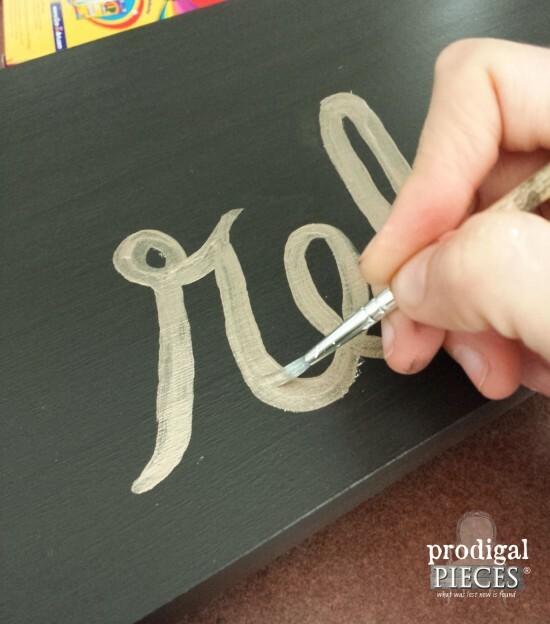 For the charcoal tray, I’m using brass handles and adding a bit of text by freehand painting. 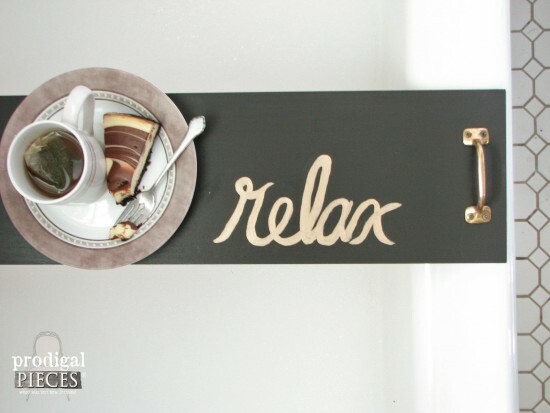 If you’re not confident you can add text, just follow my tutorial on how to DIY it. The weather tray is getting some rusty goodness and is left to look old and worn. You could add text to it too for a personal touch. So, which is your favorite? The modern version with the dark paint? I’m lovin’ the crisp feel of it and that’s what I love about our bathroom. 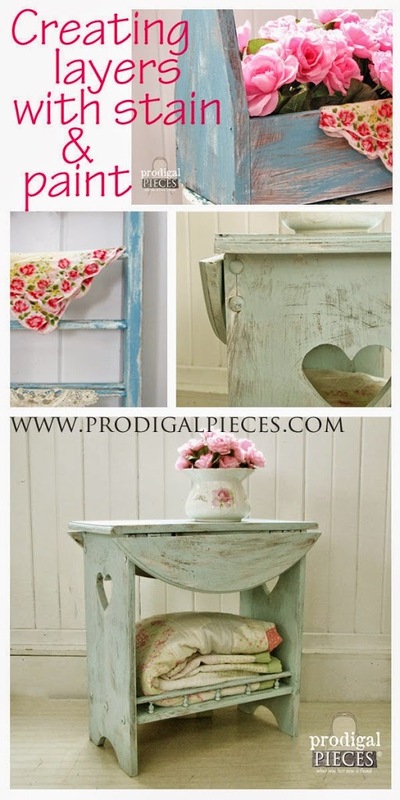 I could switch from classic vintage to vintage modern with a few easy changes. Makes you want some cheesecake and a soak, right? 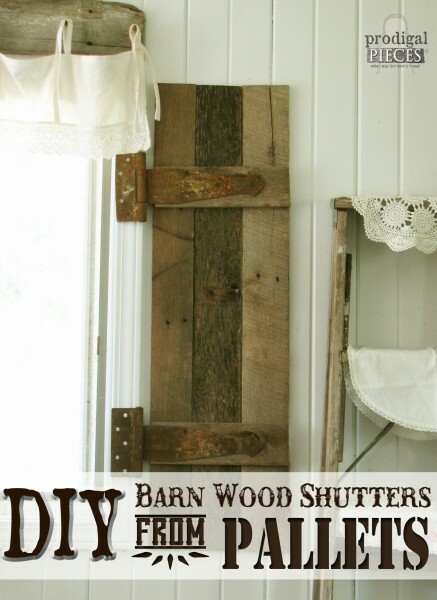 Or do you prefer the rustic new wood, made to look like barn wood? I’m head over heels that summer is practically here and I can enjoy all the beauty that abounds. 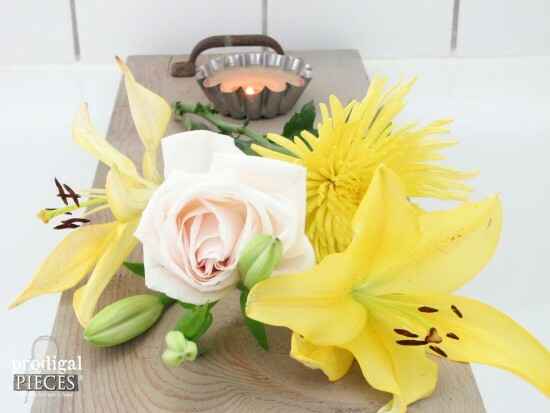 A tea light soaking with homemade beeswax candles in tart tins sounds good to me too! I hope you’ve enjoyed this simple project and I certainly welcome any and all questions you may have. 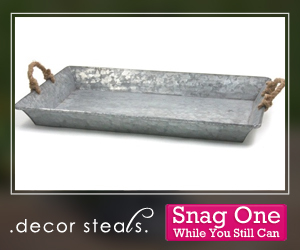 For those of you that just have to have one of my trays, they are both available in my shop. Let me know what you think and do share so others can make one too! Well one of these has just been added to my To Make List, after we have our new tub installed, because I plan on spending a lot of time in that thing! Thanks for the easy to follow tutorial Larissa! 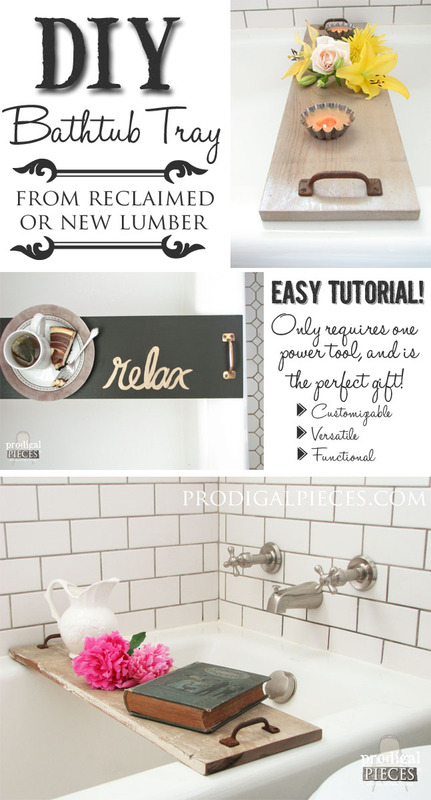 Hope you’re enjoying that pretty new bathroom. Thanks so much for sharing this, I love it! 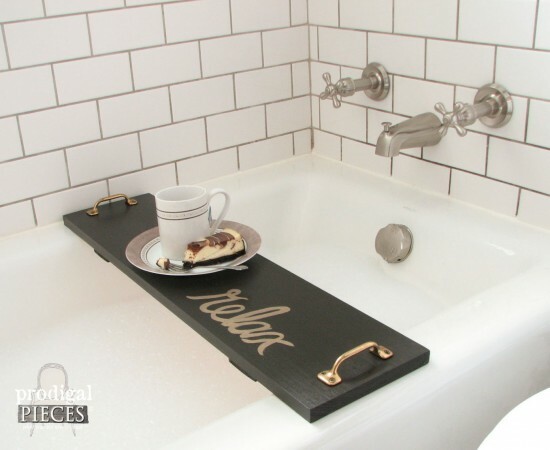 I rarely use my bath but I can imagine soaking in there with all my bits on this tray! You give me so much inspiration. We think alike. 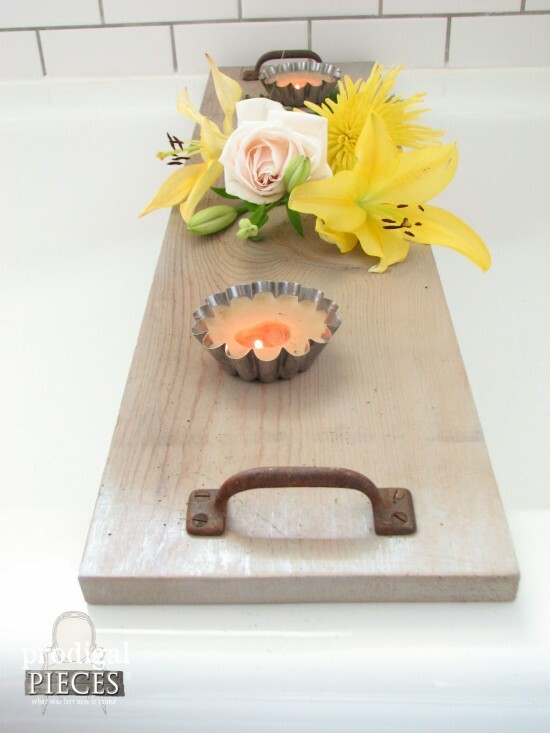 Our wooden trays are similar but I never thought to use mine for the tub! I adore yours! Thanks for sharing at Project Challenge! Great minds, I tell ya. 🙂 Thank you for hosting a fun party, Holly. Hi! Love your tutorial. What is the purpose of the furring strips?